Microsoft released Windows 10 Insider Preview Build 14971 for PC to Windows Insiders in the Fast ring today on Nov. 17, 2016. Since anything released after Build 14800 is considered as Creators Update, what’s new you see in this new build will likely be available in the final release. Microsoft Edge is the first browser that supports ePub format out of the box. 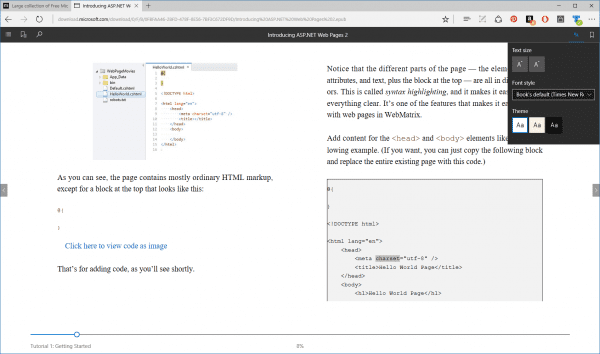 You can now read any unprotected ebook in the EPUB file format with Microsoft Edge. When you open an unprotected e-book in Microsoft Edge, you will be taken into a customizable reading experience where you can change the font and text size and choose between 3 themes: light, sepia, and dark. When you open an unprotected e-book in Microsoft Edge, you will be taken into a customizable reading experience where you can change the font and text size and choose between 3 themes: light, sepia, and dark. As you read, you can leave bookmarks, use the table of contents or seek bar at the bottom of the browser to navigate through the book. You can also search for words or phrases, or even use Cortana as the dictionary to find the meaning of the words. Starting with this build and going forward, the Paint 3D Preview app is now included as part of Windows 10. 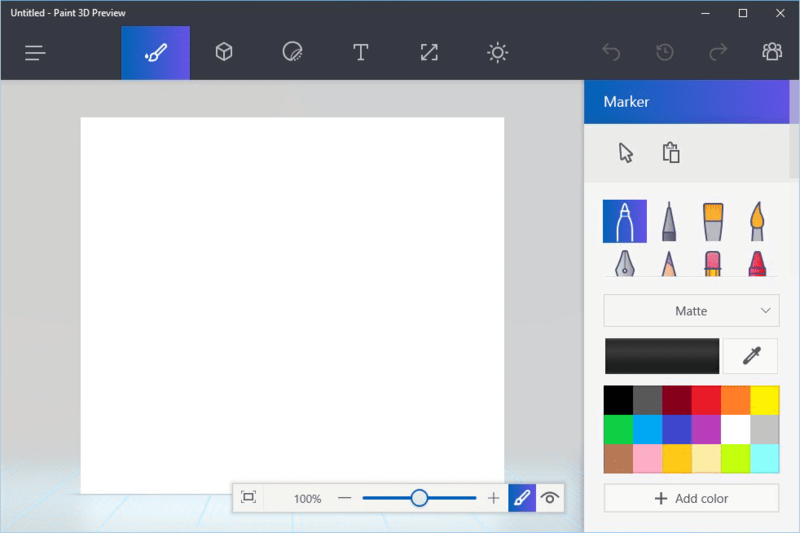 Opening Paint from Start will now take you to the Paint 3D Preview app. PowerShell is now the default command shell from File Explorer. It replaces Command Prompt (aka, “cmd.exe”) in the WIN + X menu, in File Explorer’s File menu, and in the context menu that appears when you shift-right-click the whitespace in File Explorer. 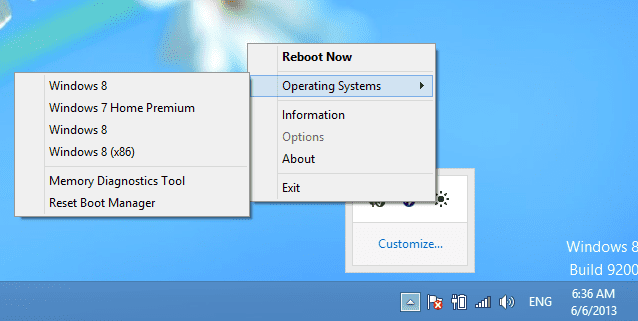 You can still opt out to use Command Prompt by default by going to Settings → Personalization → Taskbar and turning the “Replace Command Prompt with Windows PowerShell in the Menu” option off. Also, It’s PowerShell’s 10 year anniversary this week. Hop over to Channel 9 to see some of the videos we’ve been sharing about it. If you’re looking to learn more about unleashing the “power” in PowerShell, this page is a great resource. Whereas before Get Office was largely a collection of links to help you get started with Office, the new and improved app will help you explore and manage your Office experience. It’s not an app that gets you free Office programs. 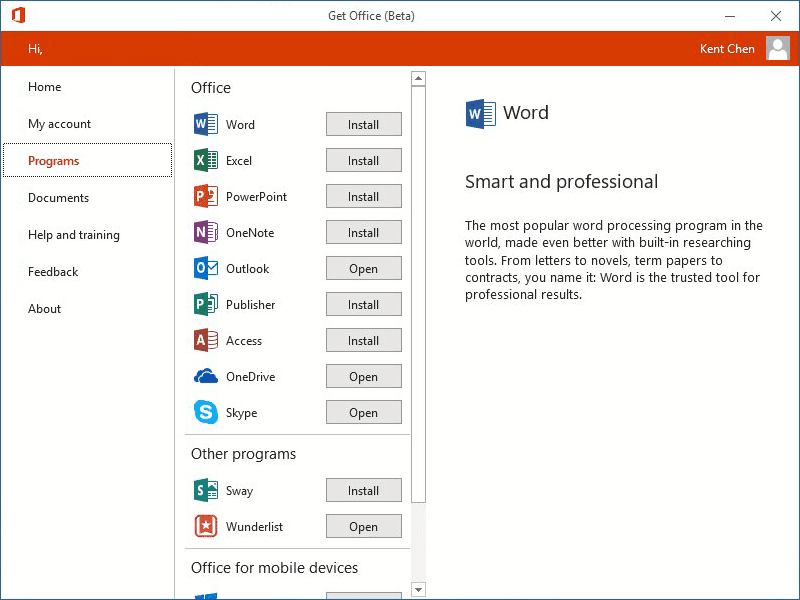 Rather, it helps you discover and launch apps and see all your recent Office documents in one place.